Three losses in a row against three teams at or below .500 is something all Celtics fans would like to forget, especially since the Celtics kicked off the new year with four consecutive wins. The losing streak has been an emotional roller coaster, with players Kyrie Irving, Jaylen Brown, and Terry Rozier all making comments about the team following games. Irving spoke about the “young guys not wanting it enough” following the game against the Orlando Magic. Brown stated “It’s all of us, not old or young guys” in response following the loss to the Brooklyn Nets, and Rozier followed by saying “the Celtics are too talented” as an excuse for the team’s struggles. 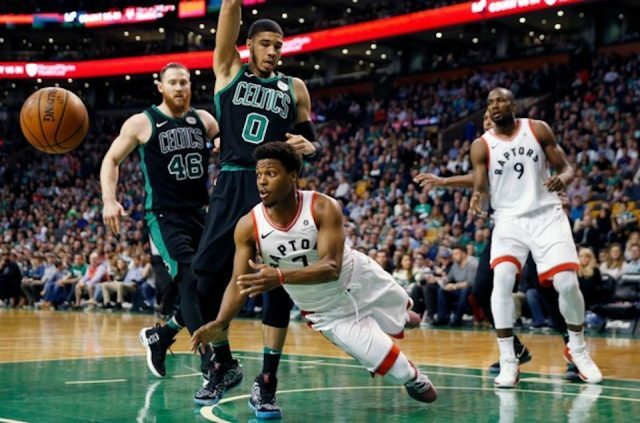 As the comments and issues continue to roll in, all eyes are moving to what could be one of the biggest games of the season against the Toronto Raptors, who sit atop the Eastern Conference with a 33-12 record. Though (as reported by @BrianTRobb on Twitter) everyone is finally healthy, including Marcus Smart and Aron Baynes who were the only questionable players on the roster, this could be the game where the Celtics regain the full trust and love of Celtics fans. Off the court issues for the Celtics have been prominent as of late, but on the court, the Celtics are not playing to their full potential. During the 4-0 run the Celtics had at the beginning of 2019, the team went on a five-game streak of 30 plus team assists as they dominated their way through the Timberwolves, Mavericks, Nets, and Pacers. However, in the three consecutive games they lost, the Celtics put up only 20 assists against the Heat, 19 against the Magic, and 21 against the Nets. Ball movement hasn’t been the only issue for the Celtics, as the bench performance and rebounding has been a recurring problem all season for the team. Over the three-game stretch, the bench has put up terrible numbers. Sixth man Gordon Hayward is putting up only 5.7 points per game. Along with Terry Rozier, Daniel Theis, and Brown, the numbers and performance from the bench have not helped the starting five in any way. Rebounding is an issue the Celtics will never be able to get over until they make a move for a powerful big man, as Al Horford, Theis, Baynes, and Robert Williams are not known for their rebounding ability. But as we all watched last season, coping with that problem was not a challenge. This year, as the team has struggled to grow and mesh together, that problem has been exploited by many teams. Coming into tonight’s game, the return of Irving, Smart, and Baynes will certainly boost the team’s chances of winning, but Brad Stevens will need to bring out the best brand of “Celtics basketball” this season to defeat Kawhi Leonard and the red hot Raptors. The Raptors have won their last five games, with their most recent game going into double overtime against the Washington Wizards, ending in a 140-138 win for Toronto. Leonard is putting up career numbers in his first season in Toronto, averaging 27.5 points per game and eight rebounds per game. With the supporting cast of Kyle Lowry, Serge Ibaka, Danny Green, and Pascal Siakam all having great seasons, the Raptors are the team to beat in the Eastern Conference. All eyes will be on the Eastern Conference matchup tonight and the Celtics ability to bounce back from three extremely disappointing losses.